We measure and model 3D objects, cities, people (using sensors, data collection, analysis etc. ), create location-based-services, combining networks, create virtual worlds, create and transfer knowledge, innovations and patents. 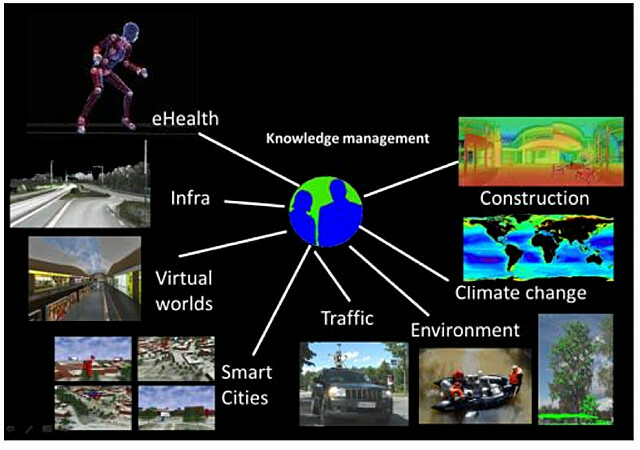 Our research is based on novel approaches of 3D measuring and modeling research and knowledge management. We use KAP (knowledge based academic platform) methods and ways to integrate innovations and best practices into our society. KAP is the way to share the know-how in our team and on the other hand share the tacit knowledge to the society. The future challenges of the Institute are to integrate spatial knowledge (includes data measurement techniques, positioning, navigation, GIS) into social value of the built environment and into housing, decision making and future retail for healthier environment, smart places and cities. The ambitious goals realize the Aalto University’s mission, which aims to change the world by means of internationally high-level research, pioneering education, border-breaking, courageous exceeding and renewal.